LEGO Worlds is an Adventure and Open World game for PC published by Warner Bros. Interactive Entertainment in 2015. It’s LEGO game again! Developers wanted to create a different version from LEGO franchise. So This game is inspired by Minecraft. An Open World title with lots of details. Enter the LEGO Worlds to explore beautiful environments. Get help from the LEGO characters to adventure at these worlds. Each player can select a character. It means that you are free at the first of the game. Creativity is the most important thing to be successful at this version. Anything you create, Is a copy of your mind’s plans. So use your mental abilities to build nice things. Buildings won’t be the only things to be created at this version of LEGO! There will be thousands of items to be built. It depends on your interests to choose some of them. Also you need to earn score to get any of items from the store. LEGO Worlds are created by millions of colorful cubes. Because of that, They are limitless. Players can customize characters and the other items. Then choose him/her skills at many fields. This character would help to reach your goals much faster. Try to get experience points for them as fast as you can. This an early access of this game. Although it is much limited than the original version, It can be funny for many hours. The original one will be released at 2016. The developers want to use players’ experiences to make a final version. The players’ rating at Steam is 9/10 up to now. It shows that many users have enjoyed the early access. 246 Comments ON " LEGO Worlds Free PC Download "
it downloaded for 6 hours and then wouldn`t even open. wtf man? WTF BRB IT DOSENT WORKS!!!!!!!!!! what is the password for the game file? wtf is your internet speed ??? IT SAYS IT WILL BE 2 DAYS NOW!!! is the code screenshot ? How I can change the Language. It’s chinese. I haven’t played lego world. Go to 3DMGAME.ini (the config file). Go down to [settings] and go to language and change schinese to en_us. when I want to open the mein file, it writes me, it can´t be installed, because there are missing so many files. Do you know any program for fix .dll mistakes? it is not downloading !!!! Is this a virus? Is this even legit? why the language is chinese? wow! it takes 4 hours to download?! iam not that pationt! i rather buy the game on steam! its toke me 2h and its amazing! but how change the language? Hey how do I change the language of the game while in the game? … you all don’t know how this free game dl download works do you? I copy the system requirements from Steam! Someone show me how todo this? I want to play lego worlds! It downloaded for two minutes. I tried http://www.freegamesdl.com and http://www.freegamesdl.com both as passwords and still won’t extract properly, does this download still work????? This thing is taking like 3 days to download!!! I’m going to predict this game is awesome before I download it. HOW?!?!??! IT SEAS 1 hr 99min NOW OVER 100?!!?!?! WTF!! why the language are chinese??? please tell me how change it to english…. Merci ! tout fonctionne parfaitement et en francais ! Whats the password please . How can I get it ??? Please help me !!!! I’m rather surprised at how many people can’t see the password located under the download links. ***TIP*** –> If you don’t know it after I had just posted where it is, you shouldn’t be downloading ANYTHING!! Or, may the farce be with you. guys i cant downloand lego worlds. the password is the name of arquivo ????? its freaking china oe japan! HOW DO I CHANGE IT? 1. Downloaded Torch. 2. Downloaded the game. 3. Game crashed and I was furious. is it work in ubuntu? OK once downloaded .. zip file shows all these files :(….what do i do NOW????? For changing language open file “3DMGAME”, find language and change it from schinesse to english ? IT WONT EVEN OPEN!!! WHAT THE HECK MAN!!! … is the human race so dumb they can’t find out how to download and setup a game? Ok, guys, since there´s been some problems with downloading and running this game, I´ve decided to explain in a very detailed way how to do all of it. (By the way, this is a great website, don´t blame it if you don´t know how to do things right) Ok, let´s begin. *Any downloader assistant, I’ll be using IDM, it’s great, uses 6 channels to download and you can download anything with it, so if your using another program, just proceed like if they were the same, almost all of them work the same way. 1- There are 2 files to download, but you only need the bigger one (736Mb), the other one is an early access, you don’t need it. This website doesn’t have a downloader assintant, wich is good (at least for me) because you can use your favorite downloader. Now, there is one thing about this, if you download it throu your internet explorer it will take hours. So, what you need to do is right click over the file your going to download (the one with 736Mb), select download with IDM (or any other downloader), press start download and wait. With this method you must have it done in about 15 minutes with a slow connection or 1-5 minutes with a faster one. 2- Once that you’re finished, right click over the archive and decompress it, it will ask for a password, type https://www.freegamesdl.net and wait. You can see clearly the password bellow the archive you just downloaded, maybe it is so obvious that you didn’t see it. 3- Ok, now you have a folder with the game, but it is in chinese, so you have to change it. Open the archive named 3DMGAME, if you double click it and it doesn’t open, just open it with the text processor. Go to the middle of the document (between the 4th and the 5th ###### lines) find the lenguage line, and change the word schinesse for english, close the document save the changes. 4- Congratulations!!! You’re done! 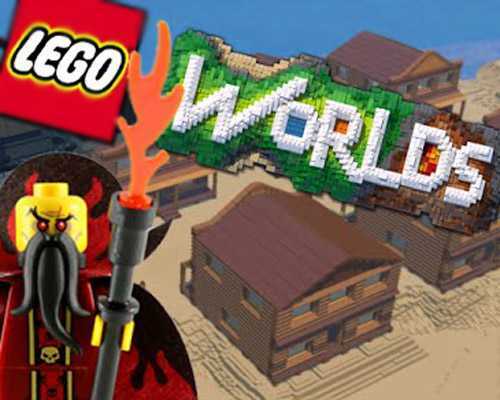 Now just double click LEGO_Worlds.exe and enjoy. Hope this can help someone, bye. By the way, I’m from Cuba, doing all by the book I spent about 7 hours to download the game because the internet here is veeeery slow, like in the late 90’s, so please, STOP Whining. Hey, if anybody needs help with the LANGUAGE SETTINGS, go to the WINRAR, and open 3DMGAME.ini. The lang will say schinese, or something.. just type, ‘english’ in it’s place, and save. DONE! Just open it up! Should work! When i try to extract I asks for password… whats the password? Why is it in Japanese ?!?! Hey! Thanks so much for hosting this website so the community can have illegal free games! I love this website so much! I wish that I could donate but I don’t have money! Thanks!